The HTC 8S probably won't arrive in the UK before the end of the week, even though some retailers suggest it will. According to Expansys, the HTC 8S in blue will be the first to arrive on our shores, with the yellow, red and black versions due later, stating "stock expected in 2 days" on its site, and telling TechRadar it "should have the HTC 8S in tomorrow." Over at Unlocked-Mobiles we get the clearest indication of a potential HTC 8S release date – with the listing claiming "stock due in this Friday." TechRadar has spoken Unlocked-Mobiles, which said: "we had a conversation with HTC yesterday and they were not forthcoming with an HTC 8S release date. "The handset may still need to pass through a Windows approval process, which means it could be pushed back to next week." 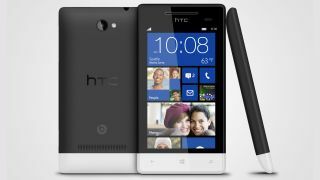 Other sites are being a bit more conservative with their estimates, with December 4 being touted as the initial arrival date of the HTC 8S – some way off the "mid-November" promise HTC made during its launch event. The 8S is the second smartphone from HTC to run the new Windows Phone 8 operating system and it slides in below the flagship HTC 8X, offering up a more wallet friendly Windows experience. You'll be able to pick up the HTC 8S for a reasonable £225 SIM-free, while contracts are due start at around £21 per month. HTC is yet to announce anything more regarding the 8S release date, but we'll let you know as soon as we hear anything.